Diamond Peak continues to expand their base lodge and add new programs, packages, and events each season to create the ultimate skiing experience in Lake Tahoe. Diamond Peak is located in Incline Village on the east side of Lake Tahoe in Nevada. Most people get Incline Village Rentals right in the town, and then shuttle or drive up to Diamond Peak Ski Resort or Mt. Rose. Known for its family-friendly terrain, spectacular lake views, and uncrowded slopes. Diamond Peak resort has great trails and offers the perfect learning environment for beginners as well as Solitude Canyon and others that offer challenging terrain for experts. Family skiing has never been better and families love Diamond Peak for our Child’s Ski Center and family ski packages. Last year Diamond Peak hooked up with Burton Snowboards to create the Burton Learn to Ride Center. A fleet of Burton beginner boards are softer flexing and easier to turn. The right equipment paired with professional instructors makes learning to snowboard easy and fun. First time beginner ski and snowboard packages are available for a decent price as well as second or third time lesson packages, intermediate lesson packages, group lessons, private lessons, family & friends packages, and more. You can buy tickets once you get to Incline Village or the Diamond Peak Ski Resort. Sometimes Diamond Peak Discount Lift Tickets are available online. You should check out the conditions in Diamond Peak to see their great snow. Diamond Peak has added many new features to its Trail Park including rails, boxes, kickers and table tops. Take a ride down the flume to reach the park. For more family friendly terrain a complete trail map can be found at if you want to checkout the challenges. Where is it? North Lake Tahoe area, about thirty miles from Reno, just a tad north of Incline Village Nevada. A great program for families and friends is their learn how to ski and snowboard class. These lessons are semi-private. This unique Lake Tahoe program is one of the best ways to learn a new sport. Last year Diamond Peak celebrated its 40th year anniversary and celebrated with popular events including the annual Dummy Downhill, the Vertical Challenge, the Snowbomb Sick & Twisted Series, the Uphill Race, and more! New and improved events and parties are planned for Diamond Peak this year. 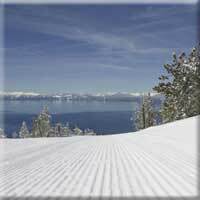 Diamond Peak resort website will have the most comprehensive information. We look forward to seeing you on the slopes and the golf course! If you would like to stay in the Incline Village resort area, you should make reservations for Incline Village Lodging in the town, in one of our rental homes or condos on the beach. Many guests prefer a nice vacation rental in North Lake Tahoe in a neighborhood that is central to all the activities on the north shore. It's a big area, our reservation concierges can help and you can make all your vacation plans through City Concierge at 866-864-6444.